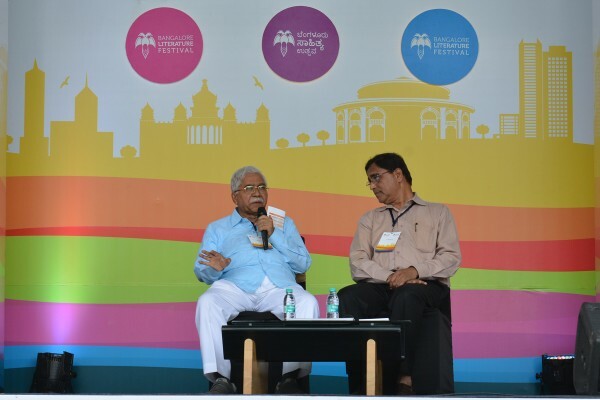 Gnanapeetha Award winning Kannada poet Dr. Chandrashekhara Kambara spoke about his formative years as a writer, his creative spirit, “contemporary folklore”, and much more in an engaging conversation with C. Naganna (Director of the Publication Division at Mysore University, Sahitya Academy Award Advisory Board member) on the first day of the Bangalore Literature Festival. Dr. Kambara began by narrating the pivotal events that inspired him to realize his creative potential. Growing up in Belagavi, a place notorious for murders in the 1940s when Kambara was a young boy. Every time a dead body appeared in the Ghataprabha river, people of his village started making up stories regarding the death. This provided a conducive environment for an impressionable young boy’s creativity and imagination to thrive. When asked about other early influences on his life, Dr. Kambara credits his mother for providing the first moral compass in his life. Later on, he was deeply enthralled by the many diverse characters which appear in Kuvempu’s works. Talking about folklore, Dr. Kambara’s forte, he opined that folklore dies with the emergence of schools in rural settings. He finds our regular-vanilla education system leaves little room for cultivating the imagination. According to Kambara, folklore exists largely in a rural setting often romanticised as sitting against progress and “scientific modern thought.” The modern education system being rolled out across our villages today is precisely this. There can be no such thing as contemporary folklore for Dr. Kambara, especially as contemporary dismisses tradition, ridicules the unexplained, and constantly seeks a logical explanation. Laughing at the thought of the contemporary folklore. Citing China as an example, Dr. Kambara finds an active role for the Government to be crucial in fostering folk forms. When asked if it was a conscious decision to stay away from short stories, Dr. Kambara said that according to him, short stories generally do not qualify as literature. Only when short stories incorporate an element of folk within would he consider them to literature. Reflecting on how his teaching experience has contributed to his literature, Dr. Kambara finds that in the company of young people, one naturally feels like telling stories. Hence, a creative atmosphere is a given by the mere presence of young blood. “My time with young people made me more creative”, he said. Just like Kuvempu, Dr. Kambara said he, too, preferred Tolstoy over Shakespeare. He said Tolstoy could be likened to Vyasa and Valmiki with regard to story-telling prowess. In fact, he found Tolstoy’s structural approach to storytelling to be similar to classical Indian plays that start with the naandi and conclude with the bharatavaakya. “People need happy endings in stories,” he said. We can’t have the boy and girl not come together in the end. That would be a tragedy for the masses. Known as the bard of Kannada literature or the “singing poet”, Dr. Kambara humbly noted that rather than a particular talent he holds, Janapada Kaavya (folk singing) has bhaava (emotion) which inherently lends it to musicality. The talk ended with the audience being treated to Dr. Kambara’s rendering of a folk song from his work Heltena Kela.